Home > Supplements Overview > How Does Melatonin Cure Jet Lag? When you fly a long distance, it can often be difficult to reset your internal clock. Many people who take long-haul flights on their holidays often find the first few days in their long-awaited destination ruined, due to difficulties acclimating to a vast time difference. That’s why melatonin has become so popular the world over, especially among people who travel. It works as it resets the body’s time clock, tricking the brain – and thus the body - into believing that it is night while the body still believes it is day. But while melatonin has been available in the United States as a dietary supplement since 1993, it is only available on prescription in the UK. It was available as a dietary supplement before 1995, but is now known as a medicinal supplement, and treated accordingly. This means that it is technically illegal to order melatonin from outside the UK and have it shipped to you, although you can legally buy it abroad and bring it back into the country with you. If you think you could benefit from taking this hormone, the only way to legally obtain it in the UK is to have it prescribed by your GP. Melatonin is a hormone that we produce in our brains. The synthesis and release of this hormone are stimulated by darkness and light, and it is thought to play a role in the circadian rhythms that humans experience. Levels of it are highest when we are going to bed in the evenings. Synthetic melatonin has been produced to help different problems and medical conditions, in particular those associated with sleep disorders, such as insomnia and jet lag. It is a powerful antioxidant that is also purported to help with a variety of ailments not associated with sleep as well. Studies on humans have shown that in many cases melatonin taken by mouth beginning on the first day of travel and continuing for a few days after can have a significant effect on whether or not you experience jet lag. In particular, the herb will help you to fall asleep faster, and will also improve fatigue felt during the day. It can also make you feel more mentally alert. However, the studies are not completely conclusive, and only half the people who followed the course of melatonin to the letter saw positive results. Remember, there is no miracle cure for jet lag, and melatonin may have no effect on you whatsoever. 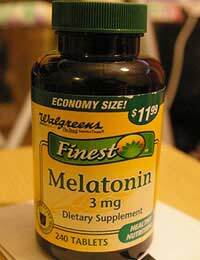 People often use melatonin for other sleep-related difficulties. People who work shift, for example, may take it to help them stay up later. It is also often used to treat insomnia in older people, as it is thought that levels of natural melatonin in the body decline as we age. As a hormone, melatonin may interfere with other the production of other hormones, including sexual development. Children should avoid taking melatonin for this reason, as well as pregnant and breastfeeding women. It is also not known how melatonin can affect people with certain autoimmune conditions such as Type 1 diabetes, lupus and rheumatoid arthritis. It can also affect people with depression, and can interact with certain drugs, as well as with other supplements. As always, only take a supplement under the supervision of your GP or other healthcare provider, after disclosing your complete medical history.